One Love Festival was launched in 2008 to mark the 30th anniversary of Reggae legend Bob Marley’s ‘One Love Peace Concert’ in Jamaica, and remains true to the ethos of peace and love, truth and rights, justice and equality. Located not far from the tube near Chigwell in North East London, Hainault Forest Country Park on the edge of London covers more than 300 acres, with a fishing lake, boating lake, zoo, and adventure play areas. 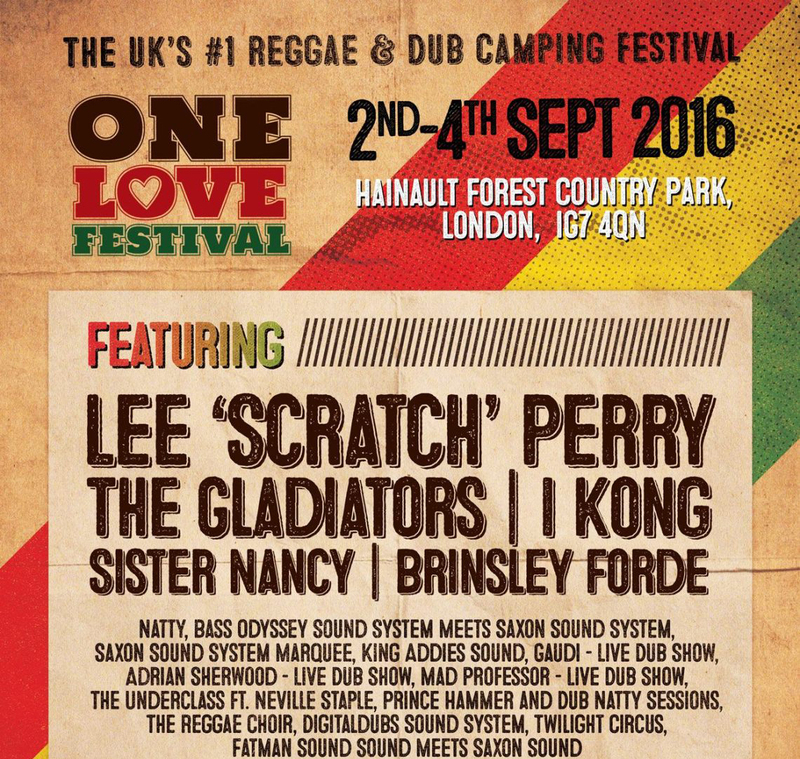 The One Love Festival brings a number of top Reggae and Dub sound-systems from all over the UK and further afield in one big soundclash. If it’s the top names in this game you’re after then this is the place to come. You’ll get to listen to some heavy, heavy bass right across the site with plenty of bobbing, ducking and skanking going on in every corner of the tents and fields. This is a family friendly event that has a warm, welcoming and inclusive vibe in the day-time, turning into a wild party carnival in the evening as people dress up and dance their way into the early hours. Expect Jamaican style patties on the food stalls and plenty of jerk chicken against a colourful backdrop of stalls and entertainments. Lee “Scratch” Perry, The Gladiators, I Kong, Sister Nancy, Brinsley Forde, Natty, Bass Odyssey, Sound System Meets Saxon Sound System (40th Anniversary Special), Saxon Sound System Marquee, King Addies Sound, Gaudi – Live Dub Show, Adrian Sherwood – Live Dub Show, Mad Professor – Live Dub Show, The Underclass ft. Neville Staple, Prince Hammer and Dub Natty Sessions, The Reggae Choir, Digitaldubs Sound System, Twilight Circus, Fatman Sound Sound, Meets Saxon Sound, King Lorenzo, Earl Gateshead, Bunny Lee, Instrument of Jah, Direct Impact Sound System, Nick Manassah, Jahcub and the Chosenones, Michael St. George, Friction & The Roots Drivers, Paul Morgan and The Messengers, King Solomon, Yechidah, Genral Steppas ft R Zee Jackson, Poorman Dub, Roots Renegade, Dread Culture, Dub Doctor, Maitree Express, The Tribe, Jah Eyes, Junior Dread, Lobster, Maximum Heights Band, Positive Vibes Crew, Ras Lando & The Internationals, Jeremiah Ferrar, The Mighty Dub Generators, Stop Press, Tree House Fire, Skipyard Rockers, Lion Star, Last Tree Squad Tony, Aleighcia Scott, Ras Pilot, CBlock, Nano Fish Dippers, Joe Angel & Pamodzi Band, Wadada, Dub Marta, Leanne and The Radix, The Stalks, Steel City Rhythm, Stig of the Dub.